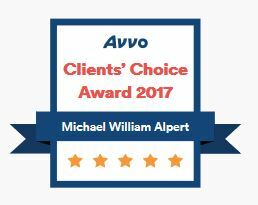 Here are recent reviews that have earned us a top rating by AVVO and accolades from Clients and peers. “I would highly recommend Micheal Alpert to handle any traffic tickets/violations any time! He has a great personality. He took care of my traffic tickets like a true professional. I was amazed how was able to reduce my points to zero. So if you are looking for a lawyer to represent you, do not hesitate. Call him and I assure you, he will make you very happy!” – Elona W.
“Mike is the best at what he does. If you find yourself needing an attorney in this area this is who you should be going to. I approached mike with a cell phone violation and he was able to get the infraction reduced to a parking ticket. The awesome results are not the only thing that makes Mike the best. He also does a good job of letting you know all your options each step of the way and keeps you informed as the process moves forward. best at what he does.” – Paul B. “Highly professional and excellent service, converted my moving violation ticket into jaywalking ticket with zero points in his very first first hearing. Thank you Michael.” – Muhammad A. “Michael is a very professional and excellent lawyer to work with. He made the process of fighting our tickets very easy, and he kept great communication with us during the entire process.” – Stephanie W.
“I found Mr. Alpert on the internet. I needed a lawyer to help me clear up some outstanding tickets in Nassau County. I live in Brooklyn and couldn’t get time off from work to get out to Nassau. Mr. Alpert did all the work for me, got my tickets reduced and even got points taken off my license. I always spoke directly to him and when I emailed him he always responded back in a timely manner. He was very helpful and knowledgeable. Also, his fees were reasonable. It was definitely a very pleasant experience and I would recommend him to anyone who needs a lawyer. And of course I would definitely use him again. But hopefully I won’t need to, at least for traffic violations.” – Tiara T.
Knocked 5 points down to 0 points – Highly Recommended! “Michael is highly recommended. We hired him to handle some traffic violations. He was able to knock 5 points down to zero points and some minor fines. His fees are reasonable as well.” – Alan N.
“Expect nothing but the best. 18 points reduced to zero.” – Melwin W.
“I recently retained Mr. Alpert to assist with my son’s traffic violation. I initially reached out to him and despite being away he responded. He was consistent and timely in his response. My son had 2 court dates. He represented him in both instances. The charge of aggregated unlicensed operator could have come with hefty fines and possible jail time. He negotiated to no points assessed, no jail time and minimal fee. Hands down he was more than I expected. I will be using him again and recommending him to my friends and family. He is honest and knows the law.” – Norma D.
“I endorse this lawyer. I have known Michael since we attended Hofstra Law School. He has a wide array of expertise, offering expert counsel in many areas. He was of particular assistance to my wife in connection with vehicle/driver’s license issue, securing full dismissal of the matter. He also drafted our wills. I have full trust and confidence in his abilities and would seek his counsel on almost any matter. In sum, he is a terrific attorney.” – Richard B. Very professional and personable attorney.